The $15 billion project is a road paved with failures, successes, and what-ifs. 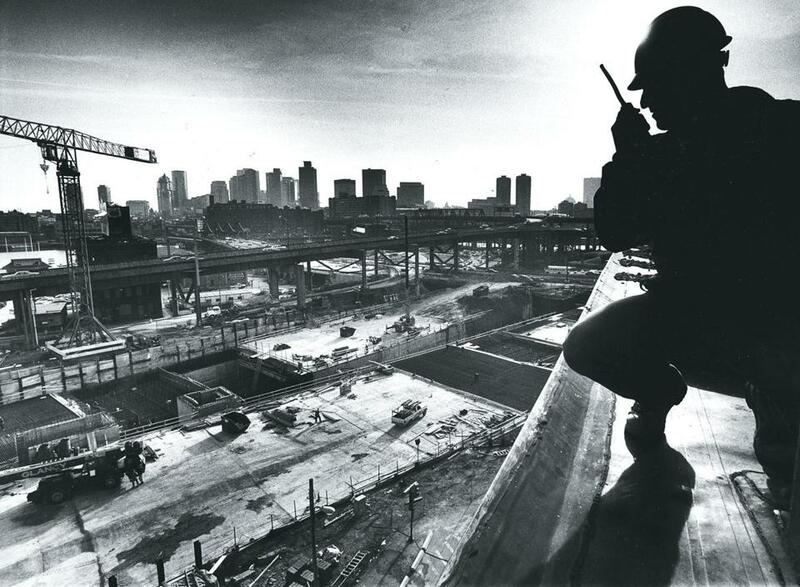 Dan Gasbarre, a Perini Corp. engineer, surveys the construction of tunnels north of downtown from a roof in City Square in 1991. It was our obsession spanning three decades, the kitchen renovation that would never end, fodder for late-night television jokes. The Big Dig was no mere act of public works, never talked about in the way New Yorkers refer to the Lincoln Tunnel or the George Washington Bridge — infrastructure that cleanly does its job. Ours was the mega project of faulty epoxy, light fixtures dropping like pine needles, Ginsu guardrails, and sea water leaks. The boondoggle, good money after bad, the white elephant. As the most expensive highway in US history, the Central Artery and Tunnel project had a special, contradictory destiny: an engineering marvel deemed to be ill-conceived from the start. We stood on the sidelines darkly, shaking our heads, exercising Yankee pessimism honed by generations of not winning a World Series. This thing would never work out. There was too much opportunity for incompetence and corruption. They’d blow the save in the ninth inning and we’d all go home unhappy. It didn’t just cost a lot of money. The copy-and-paste phrase on reporters’ computers was that it was “plagued by cost overruns,” ballooning from $2.6 billion to nearly $15 billion ($24 billion, counting interest on the debt). It didn’t simply take more time than expected; it was eight years behind schedule by the time it was done. And it didn’t just have flaws. There seemed to be mistakes at every turn, making the price tag even more laughable, from design blueprints that didn’t line up properly, to the faulty mixing of concrete, to, most tragically, a ceiling collapse that killed a car passenger in one of the new tunnels. Yet, here we are, 10 years after the official completion in 2006. How are we feeling now? Maybe there’s room for some grudging appreciation. Rush hour brings what radio reporters refer to as heavy volume. But the traffic moves, and for 1.5 miles through downtown Boston, it moves out of sight, underground. Above those famously expensive tunnel boxes is some of the most beautiful and valuable urban real estate anywhere in the nation, if not the world. Getting to and from Logan Airport has never been easier, whether picking up grandma or getting an executive to a startup in Fort Point or along Route 128. To everything there is a season, and a 10th anniversary — in Big Dig lore, the 2006 opening of the Albany Street ramps marked its completion — is a time for taking stock. A full decade since this thing was wrapped up. Boondoggle or bargain? If we could turn back time, what would be done differently for better outcomes — or would this mother of mega projects be attempted at all? A worker moves earth near the Red Line. The cow-path quilt of streets on the Shawmut Peninsula — essentially downtown Boston — did not transition smoothly to the automobile age. Congestion, coupled with the perceived need to compete with flourishing suburbs, prompted Boston and cities around the nation to create urban freeways. New York City master builder Robert Moses established the model with highways like the Cross Bronx Expressway, and Boston eagerly followed the game plan with the construction of Interstate 93 through downtown. The elevated six-lane Central Artery, which opened in 1959, linked the Southeast Expressway with points north, with plentiful offramps to access the city and its proliferation of above-ground parking garages. By the end of the 1960s, however, cities started to say no to rampant highway building. SoHo thwarted Moses’s Lower Manhattan Expressway; San Francisco residents put a stop to freeways infiltrating the urban core; and Eastern Massachusetts drew a line in the sand as well, stopping the Inner Belt, a mini version of Route 128 that would have run from Roxbury to Somerville, and the Southwest Expressway, which would have blasted Interstate 95 in the south all the way to Back Bay Station. The Commonwealth instead poured money into transit projects like extending the Red Line while the Central Artery was left to bear the burden of highway traffic by itself. By the early 1980s, the elevated roadway was hopelessly congested, and engineers pronounced its structural failure imminent. Enter Governor Michael Dukakis and the man who would become his transportation secretary, Fred Salvucci, who picked up on an MIT colleague’s audacious suggestion in the 1970s that instead of building a new elevated structure, I-93 should be rerouted through a tunnel. US House Speaker Thomas P. “Tip” O’Neill, for whom the mainline tunnel is named, cajoled and persuaded Congress to pay 80 percent of the project, taking advantage of New York’s decision to abandon a similar highway submersion project along the Hudson River. The concept was not entirely new; I-93 was already underground through the Dewey Square tunnel from Chinatown to South Station. Boston would simply finish the job, tear down the unsightly Central Artery, and reconnect severed neighborhoods in the process. Early on, however, it was clear that depressing I-93 wouldn’t by itself be enough to ease congestion. Traffic would still snarl trying to access the Callahan Tunnel to Logan Airport, East Boston, and points north. To close the deal, plans were drawn up for the extension of Interstate 90 under Fort Point Channel, the South Boston Waterfront, and Boston Harbor. The Ted Williams Tunnel became the necessary appendage in the Central Artery and Tunnel project, appealing to the feds because it would complete an interstate highway system. But with expanded scope, costs and complications started ratcheting up. Planning for the new world order got underway in 1982. Downtown Boston (above), before and after the Central Artery was replaced with an underground tunnel. To see the change, move the line above to the left or right. Fast forward to today. For $15 billion, what does success look like? There are many ways to measure outcomes, but let’s start with the basics: How is motorized vehicle traffic moving through the new system? After it opened, the Central Artery comfortably carried about 75,000 vehicles a day. By the early 1990s, that number had reached 200,000, making it one of the most congested highways in the United States — and projections into the 21st century were for many more cars. Looking at the new roadway system by itself, the Central Artery and Tunnel project is solving that problem, with capacity to spare. It handles about 536,000 vehicles each weekday. Bottlenecks are minimized through the use of the add-a-lane design, where onramps become a permanent additional lane, requiring less merging. There are caveats. The theory of induced demand — that as more highway lanes are built, more traffic will come to fill them — has played out as predicted, particularly at the Ted Williams Tunnel, where traffic typically stacks up every evening trying to get to East Boston, Logan, and points north. And the Big Dig doesn’t solve congestion south and north of downtown. A 2008 Boston Globe analysis found that while traffic was moving better in the core, it was worse elsewhere. Greater Boston continues to rank high in national congestion surveys. Then there’s the big counter-narrative: In the era of climate change, it’s no longer politically correct to be proud about moving vehicular traffic around. It’s like tobacco companies crowing about increased cigarette sales. As a 20th-century, last-of-its-breed highway project, the Big Dig does its job. It’s working as the traffic engineers planned — within the scope of the project. That’s a big asterisk. The rationale was that easing gridlock downtown would be beneficial for the economy and the flow of goods and services. But the Big Dig can’t, and doesn’t, achieve that goal for the entire metropolitan region. No other aspect of the project has so much good news and bad news balled up within than the design and execution of the Central Artery and Tunnel project. Fred Salvucci’s big idea — to depress the highway underground — presented a moonshot-caliber engineering challenge. Most tend to forget one huge specification: The tunnels had to be created while traffic flowed nonstop on the elevated Central Artery above. The city needed to stay open for business throughout, a little like modifying an airplane in flight. Oh, and add in unstable conditions because most of the alignment was in mushy Colonial-era landfill. Barney Frank, then a US representative, struck a nerve by saying it would be less expensive and less complicated to raise the entire city up around the Central Artery than to bury the highway. So how did the engineers do? By deploying the slurry wall construction method — essentially building one wall of the tunnel and then digging sideways — they used the best available technology and equipment at the time. Hauling the dirt to Spectacle Island worked well. But this project was always all about the modifications as the work progressed. The joint venture team of the state, Bechtel/Parsons Brinckerhoff, and lead contractor Modern Continental had to act like Matt Damon and his NASA team in The Martian, continually confronting problems and figuring out ways to solve them on the fly. 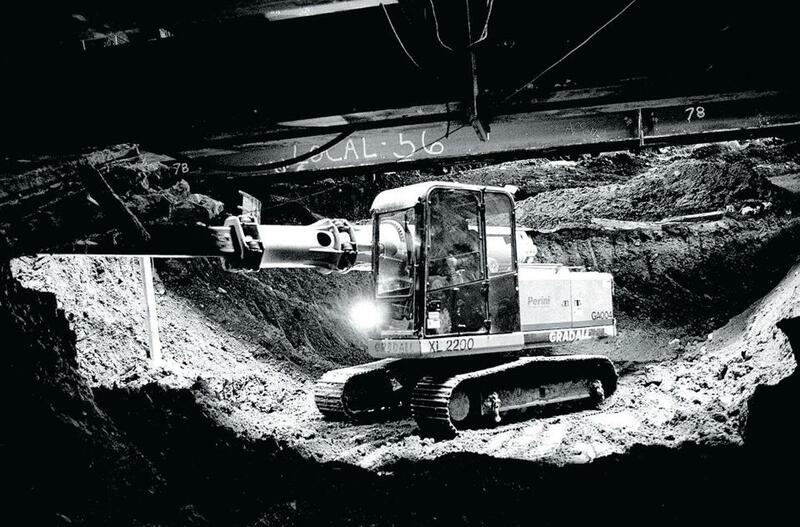 When the soil was discovered to be hopelessly unstable at the South Station rail yards — the key intersection of I-90 and I-93 — refrigerator units were brought in to freeze the ground so work could be done below. A set of tunnel boxes for the I-90 connector — the largest weighing about 50,000 tons — needed to match up exactly in the murky waters of Fort Point Channel; engineers deployed an elaborate jacking system that was unprecedented in its use and inflatable devices to float the giant sections into place. All those modifications added to the bill. And for every triumph, there were gaffes. Some were in design, like a miscalculation of a tunnel alignment, the guardrails that turned out to be lethal in car accidents, or the lighting fixtures that cost more than $50 million to replace. Some failures were due to problems in the construction process, such as the concrete that was not properly mixed, leading to leaks. And some were a combination of design and execution; the ceiling collapse that killed the car passenger was traced to problems in epoxy. But it turned out the heavy panels requiring the glue weren’t necessary in the first place. At the drawing board, engineers thought an elaborate system was necessary to make sure the ventilation and exhaust fans operated properly, but in fact something more bare-bones worked fine. The architects of infrastructure are expected to get everything 100 percent right, but tragically, some realities only become apparent by way of failure. Workers dig away inside a tunnel far below Dewey Square. As the budget for the Big Dig kept going up and up — sort of like one of those thermometers showing donations to a charity — the public assumption was that there must be massive overcharging by contractors, if not outright corruption at work. To be sure, there were fraud charges, most notably surrounding the provider of flawed concrete. Thanks to federal and state investigations, criminal prosecutions, and other follow-up, most of the costs of the most blatant mistakes were recouped. The Globe identified approximately $1 billion in design flaws, and Bechtel ended up essentially reimbursing about half of that. One of the most enduring critiques was that the entire public-private joint venture arrangement was inherently inadequate to control costs — that the state wasn’t being hard enough on contractors, and thus failed to safeguard taxpayers’ money. That was legitimate criticism. But there was no systematic corruption, at least not the kind seen in infrastructure projects elsewhere in the world. At its peak, the Big Dig employed upward of 5,000 workers, and for a project of its size, it had a low injury and fatality rate. Public works construction jobs are always good for the local economy, a steady foundation through good times and bad. Because of the overruns, however, Massachusetts taxpayers are still paying the bill. The state was on the hook for 20 percent of the original proposal, and when costs rose past a certain threshold, for 100 percent of overruns. Part of that burden fell to increased tolls on selected roads, bridges, and tunnels — a sensible system for paying for highways. But the Big Dig helped push the entire Massachusetts transportation financing system out of whack, just at a time when we needed to figure out how to pay for a lot of other things. Projects elsewhere in the state suffered, giving anyone outside the city another reason to hate on Boston. There were plenty of people who were thinking about the bigger transportation picture and who attempted to make sure that if billions were spent on a highway project, the region’s transit should also get a boost. A coalition led by the Conservation Law Foundation sued to ensure several improvements, including new stations and cars, a Red-Blue line connector from Government Center to Massachusetts General Hospital, the extension of the Green Line through Somerville, the extension of the Blue Line to Lynn, and the restoration of Green Line service through Jamaica Plain. The report card on this effort is not good; the state, pleading poverty, kept few of those promises. The Silver Line bus rapid transit line works well from South Station through the Seaport District and to Logan Airport, but the ambitions of a one-seat ride from Roxbury to Logan faded away. The MBTA is now working desperately just to keep running through the winter. An interesting side note is that the chief agitator for Big Dig transit mitigation was Stephanie Pollack, then at the Conservation Law Foundation, now the state transportation secretary struggling with — what else? — ballooning costs in the proposed extension of the Green Line. The woman who demanded the transit improvements, now in power, can’t make them happen. Transportation infrastructure is wicked expensive. Backers of the beleaguered Big Dig were fond of saying that it wasn’t really a highway project but rather an exercise in urban beautification. On that score, the project has unquestionably delivered. The Leonard P. Zakim Bunker Hill Bridge is B roll for Monday Night Football. 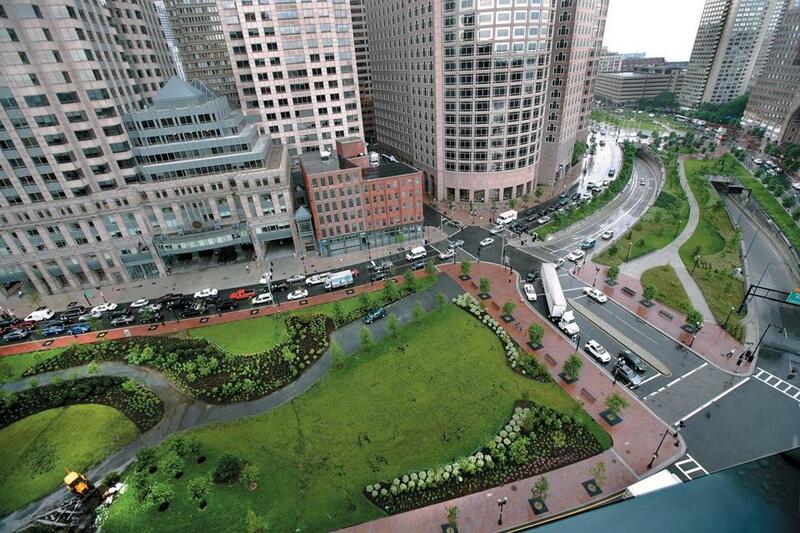 The Rose Fitzgerald Kennedy Greenway snakes along parks, open space and amenities, public art, food trucks, farmers’ markets, a fountain, carousel, and Harbor Islands visitor center. The dismantling of the elevated Central Artery was nothing short of transformational, opening up views at Faneuil Hall Marketplace across to the harbor, knitting the urban fabric back together at Hanover Street in the North End, and ushering in new cityscapes at Bulfinch Triangle — where the elevated Green Line at North Station was also depressed. Entire generations have no memory and no idea that the hulking elevated viaducts were ever even there. The part of the project known as “surface restoration” was itself a tortured process. There was very little money left over for the landscape above the mainline tunnel. The project backers hoped to come up with half a billion dollars by selling off air rights for real estate development, primarily at both ends of the corridor, from south of Kneeland Street to the North Station area. On the Greenway itself, grand public buildings and spaces — a YMCA, a museum, a winter garden, and botanical garden — were envisioned for the so-called ramp parcels, where traffic flowed in and out from underground. But building in these areas in reality was found to be hugely expensive, far beyond any organization’s capacity for fund-raising. The grousing continued: We paid $15 billion to depress the highway and we can’t even put anything with some wow factor on top? But a funny thing happened; it didn’t really matter. Gardens and walkways, a nice pavilion here and there, a few movable chairs, and low-cost pop-up urbanism installations seem to be doing the trick. Less is more. So it is that the greatest success of the Big Dig is this: It established a new landscape for the city to flourish all around it. Buildings once overlooking a clogged highway now have a beautiful park at their front door. That’s all it took. Boston would probably be booming even without the Big Dig. But the project removed all doubt. Numerous reports have chronicled big jumps in property values. The Shawmut Peninsula is some of the most sought-after and desirable urban real estate in the country. And that raises the next question — a missed opportunity. All this increase in value is a windfall for private landowners and developers. What if there had been a system in place for the private sector to contribute to the infrastructure that prompted those increases in property value? The concept is called value capture, and its use is widespread in Latin America. If we did the Big Dig all over again, we’d be smart to find a way to leverage the public investment that makes private development so profitable. (The idea has been floated for the Green Line extension—a project now in jeopardy—where private landowners and developers at transit-oriented sites would pay for the stations that would help make them rich.) At a minimum, landowners and developers should have been charged a special fee to go toward the creation and maintenance of the Greenway. That kind of “betterment contribution” would be a tiny fraction of the profits gained by a view of or proximity to a park. All kinds of previously nondescript buildings are being redeveloped and turned into lofts and office space — buildings that had little value when they overlooked an elevated highway and are now suddenly on a gold coast. New developments, like the InterContinental Boston, enjoy a prestige address, and there is more to come, including the major redevelopment projects of the Government Center Garage and the Harbor Garage. These sites are the Boston equivalent of Fifth Avenue along Central Park in New York City. If the Big Dig were to be built today, it would benefit from the new tunnel-boring technology currently deployed in the Swiss Alps for the 35-mile-long Gotthard Base Tunnel, the world’s longest, and for the Alaskan Way Viaduct replacement at Seattle’s waterfront. The latter is the closest equivalent to the Big Dig in the United States. Today’s construction methods save some money — but make no mistake, mega projects are expensive. 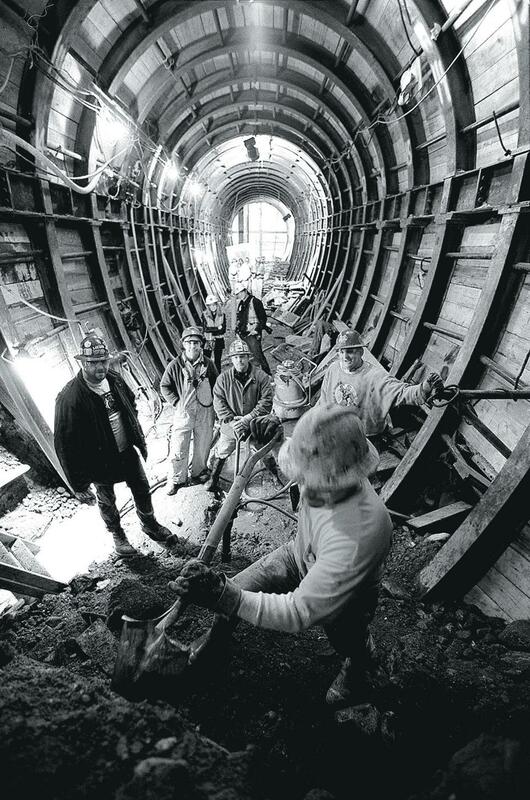 The Seattle project is $3 billion and counting; the Swiss tunnel logs in at $10 billion. In New York City, the trifecta of the Second Avenue subway ($4.4 billion), the East Side Access rail system ($10 billion), and a new Hudson River rail crossing and related improvements ($20 billion) starts to add up to real money. The Chunnel connecting England and France, which opened in 1994, cost $21 billion; the 26-mile Crossrail connecting just the city of London will cost $23 billion. John Kerry, then a US senator, took a lot of flak for saying that the Big Dig would ultimately be viewed as a bargain, but he wasn’t that far off the mark in this context. If we want to transform our cities, it takes big investment. The London metropolitan region made the decision to double down on transportation infrastructure, confident that Crossrail will make the city work better. Today’s marquee mega projects are all about mass transit. Should so much have been invested in new highways? A little-known fact is that there was another way. Confronted by the deteriorating Central Artery back in the 1980s, we could have chosen not to replace it at all. With the I-90 connector and Ted Williams Tunnel in place for a fraction of the cost, I-93 could have been turned into surface boulevards from the mouth of the Dewey Square Tunnel at South Station to Charlestown. Consider San Francisco, where community activists put an end to highways through the city; traffic flows along city streets, through the Marina to the base of the Golden Gate Bridge. When the 1989 earthquake destroyed the Embarcadero, the elevated highway viaduct was not replaced; instead there’s a beautiful boulevard along the bay. From New Orleans to Milwaukee, planners seek to tear down hulking elevated expressways, restoring the urban fabric to what it was before the Robert Moses era. It’s the Big Dig without the big dig. One can hear the naysayers now: That would never work here. The Central Artery was aptly named. And so we are left to judge what was done — hiding the highway at tremendous cost and some tangible benefits. More than a decade ago, Turnpike Authority chief Matt Amorello, then in charge of the Big Dig, wanted to have the Boston Pops perform underground for a key mainline opening. The notion of a celebration was quickly criticized as inappropriate, given the mistakes, delays, and cost overruns. The question now is whether we might allow ourselves a little music. Anthony Flint, who covered the Big Dig as a reporter for the Boston Globe, is a fellow at the Lincoln Institute of Land Policy. Send comments to magazine@globe.com.